On a trip to Myrtle Beach earlier this year, my friends and I were sitting on the beach catching up and enjoying watching some pelicans and gulls feeding about 80 yards or so out in the ocean. In fact, most days we were treated to the sight of pelicans plummeting head first into the rolling waves in search of prey, and it was a spectacle I had not tired of watching. 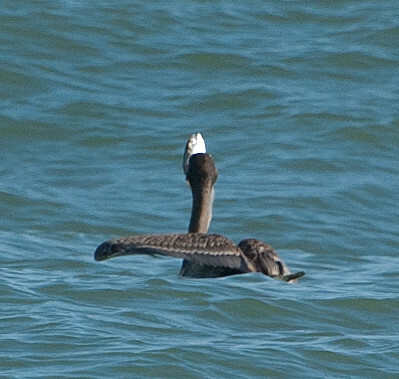 After a bit, we noticed some unusual behavior as one of the pelicans began flailing around and going through all kinds of unusual contortions. I didn’t have my binoculars with me so took a few shots with the telephoto lens and when I loaded them onto the computer saw what was causing the commotion. Not the greatest pictures, but they show that the pelican had speared a fish on its upper bill and was trying really hard to figure out how to make it dinner! 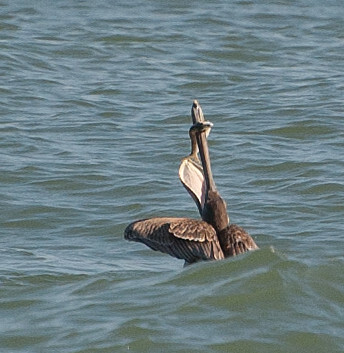 Brown Pelican with fish speared on upper bill – how to get it down the hatch?!? This entry was posted on 22 December 2011 by patacoate. It was filed under iPhone and was tagged with Brown Pelican with Fish. I myself make very little effort to eat fish. Especially recently-speared sushi. Well, well – that is a first for me. I would never have guessed that the upper bill was sharp enough to penetrate and spear a fish. 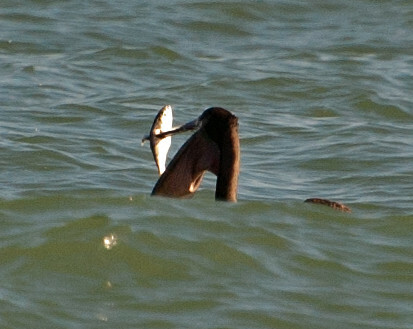 I wonder whether the pelican speared the fish on purpose or simply missed when it was trying to scoop it up?